Gosh, Has it really been so long since I did a blog post?!? The days just fly by don't they. Oh well I'm here now with some fun news and lots of photos. In fact it's a bit like three posts in one. and it's big sister Quiltmania. Well, I'm rather embarrassed to say I had forgotten to update my subscriptions. It was on my list of things to do but the days flew by and before I knew it I noticed the new editions were out and about. I quickly jumped online and in no time my subscriptions were renewed. Phew! It meant I waited a little longer to get them but they've now arrived. Yay! 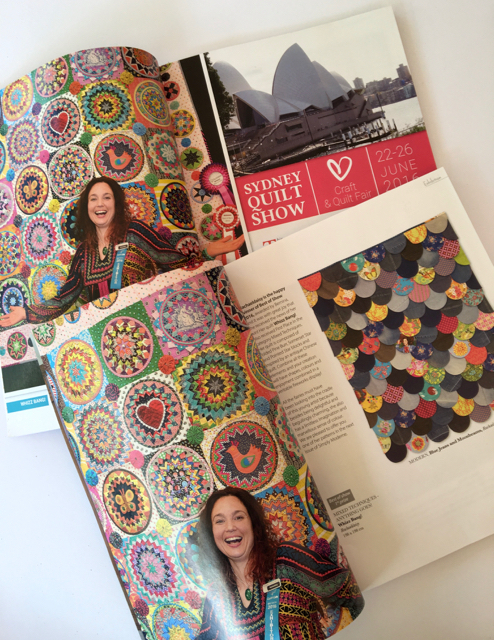 The funny part is that it just so happened that these two copies of the magazines both had pictures of me and my quilts in them as part of a wonderful overview of the Sydney Quilt Show. 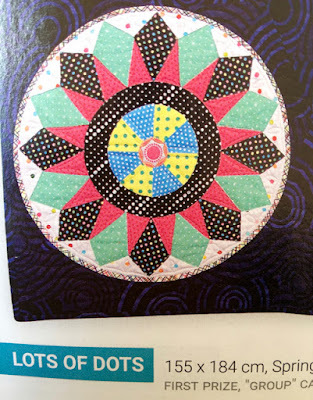 The two magazines show different quilts from the show. 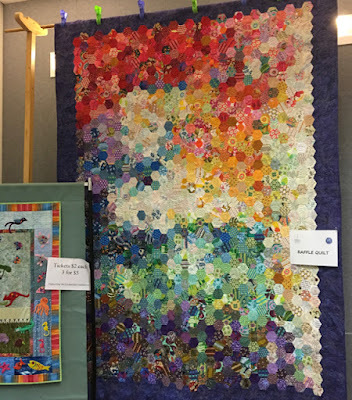 Simply Moderne showing more modern quilts, and Quiltmania leans towards traditional but one that is in both magazines is the 2016 Springwood Community Quilt Show raffle quilt that won first place in the group category at the show. In case you're wondering which block I made - it's the one in the one in the bottom left hand corner. So the moral of the story is don't forget to keep your favourite magazine subscriptions up to date because you never know what wonderful things you won't want to miss out on. 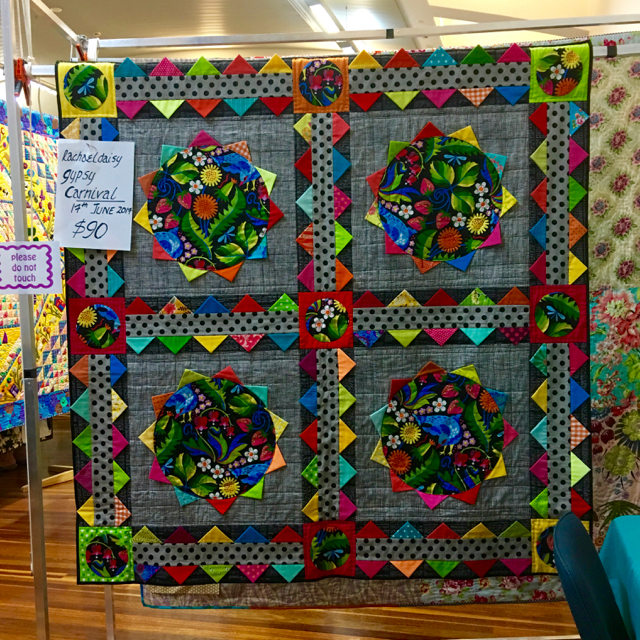 The biggest Thank You to Quiltmania and Simply Moderne not only for the photos and very, very, very special things you wrote about me and my quilts but also for the wonderful overview of the Sydney Quilt Show. 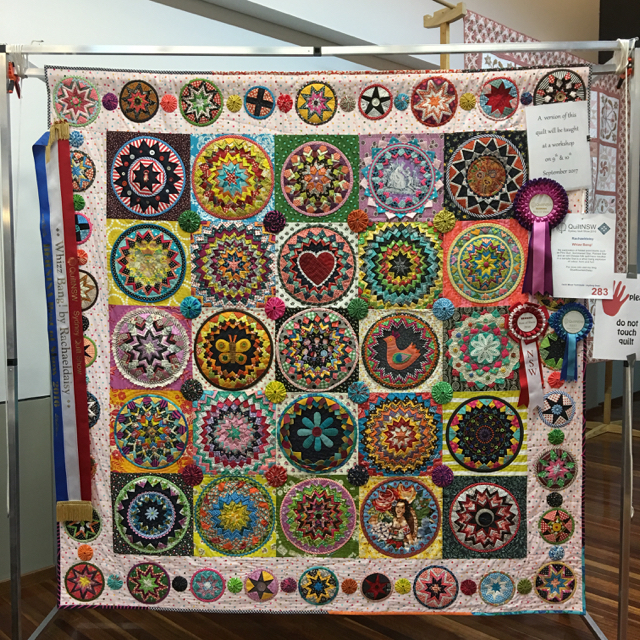 You've captured what a wonderful show it is with it's wide variety of amazing, colourful quilts. 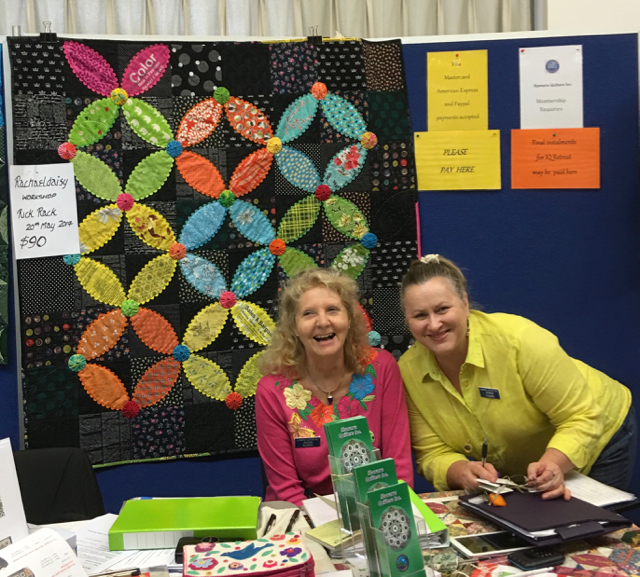 Thank you for sharing our Aussie quilts with the world. 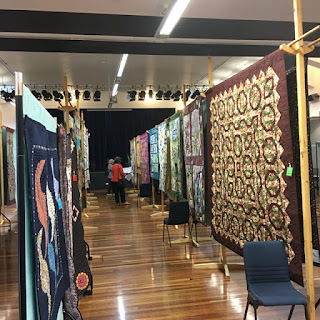 Talking of sharing quilts, last Sunday Mr Daisy and I zoomed down out of the mountains to spend the day at the Illawarra Quilters quilt show. The Illawarra Quilters hold their show every two years and from the amount of beautiful and amazing quilts in the show these quilters stay busy with their needles and fabric. I really seem to be out of practise at taking photos when I'm out and about these days. I could kick myself, the group had made two raffle quilts but I only got a photo of one of the quilts. A beautiful big hexagon quilt. Did I say big? Make that huge!! It was a beautiful wave of colours and fabrics. I thought it was such a great idea for a group quilt. Any of the quilters I mentioned it to said they had such a fun time making it. I know whoever is lucky enough to win it will love it too. My Whizz Bang! quilt was on display to promote the workshop I'll be teaching next year in September. I'm making a new exciting version of this quilt especially for teaching. It's a 2 day workshop and I know it will be lots of fun! But that's not all, when Roslyn and Joanne came to pick up Whizz Bang! they found some other quilts for classes. Ric Rac Razzamatazz with it's ric rac edged melon shapes and colourful yoyos will be a 1 day workshop held in May next year. That's Joanne in pink, I didn't get the name of the lovely lady in yellow but I loved the way they matched the colours in Ric Rac Razzamatazz. Gypsy Carnival is a fun way to play with prairie points! It's a great quilt for showing off a favourite big scale fabric. I think this would be fun made in Christmas colours or with big fussy cut flowers in the circle centers. This one day workshop is held in June. I'm not sure if there are any spaces left but if you are interested in any of these classes email illawarraquilters@gmail.com. I'm sure we could always fit in another person or two. I'd love to see you there. Here I am with Roslyn. She is such a burst of sunshine, one of those people you can't help but be happy around. To see lots of photos of quilts from the show hop over to the Illawarra Quilters facebook page here. On the home front here are a few random photos I've taken over the past few weeks. It really seemed as those this regal Kookaburra posed for this portrait. A peek of a quilt that is now finished, I just need to take photos. 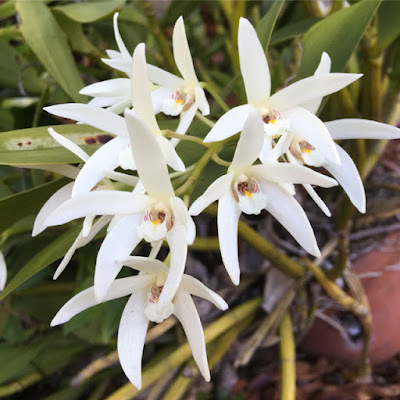 A beautiful Sydney Rock Orchid flowering in my garden. 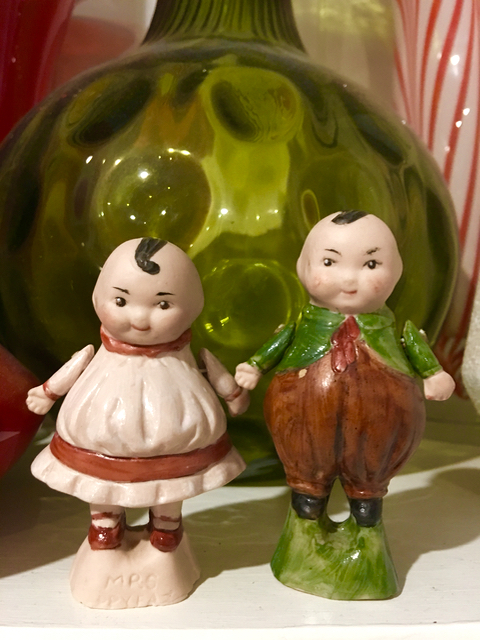 Mr and Mrs Happy say "Have a happy day!!" And I say "Have a fun week everyone." classes Photos quilt show Quiltmania Simply Moderne WhizzBang! Sounds like a trip over- the- ditch could be in order for next year, I'd love to attend one of your workshops! Lots of wondeful pics, look forward to seeing more of your latest quilt! Such lovely news you will be teaching. Your quilting vision has always been a wonderful mix of traditional and modern. Enjoy this part of the journey. Oh dear Rachael its just not the days passing by it's the whole year!!! Wow Rachael you are doing so well...just marvellous!!! 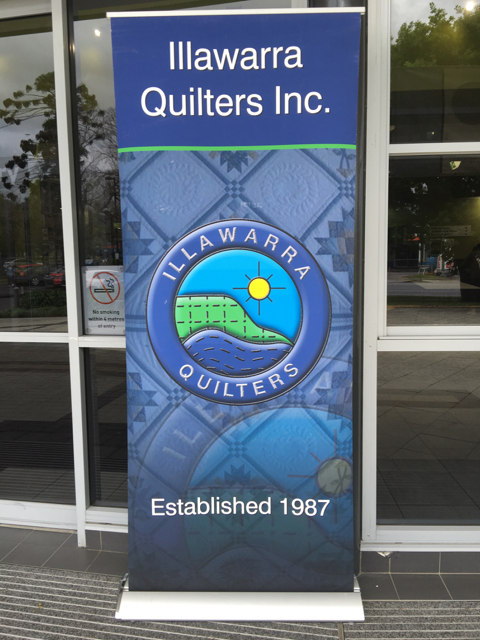 I'll have to check out Illawara Quilters and maybe get up to their next exhibition! Now to have a read of your posts! You certainly received your magazine quickly after our emails re subscription. 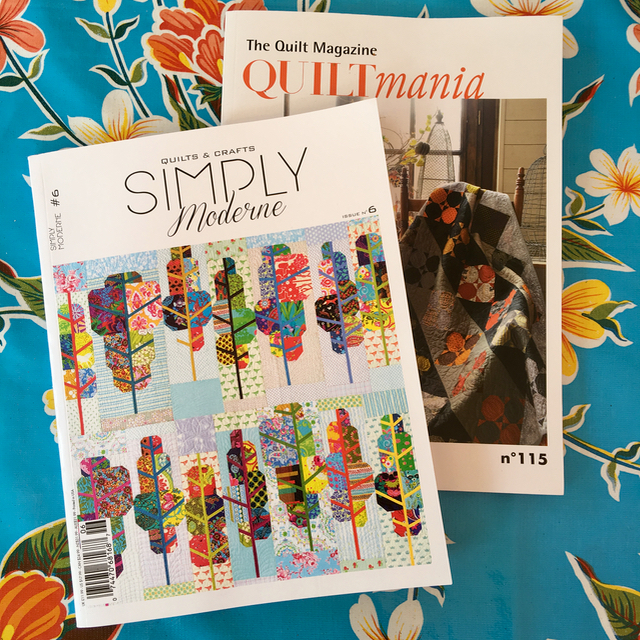 I loved this issue - and have to say again I loved the article about your two quilts. What about that hexagon quilt in the show - stunning, I should love to make one like that!! 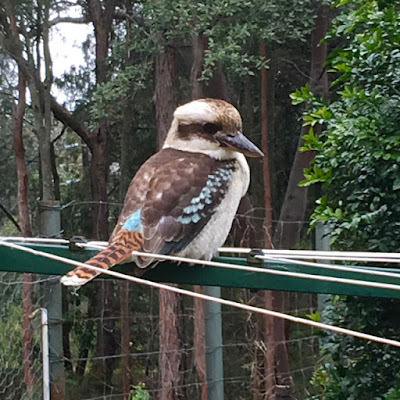 Cute little kookaburra too. 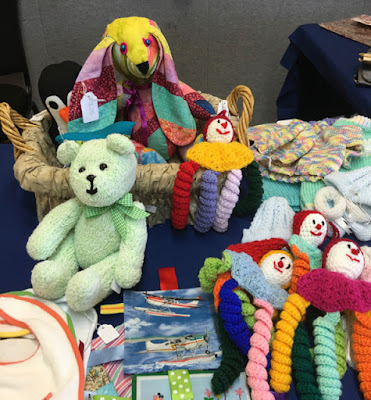 What a happy post, full of fun-filled days and quilt yummie-ness! And a kookaburra! What a surprise to see him today! Congrats on your nice mentions, well-deserved - and a good reminder to get those magazine subscriptions- I've been meaning to! Happy quilting! Always fun to read about the full and happy life of Rachaeldaisy! 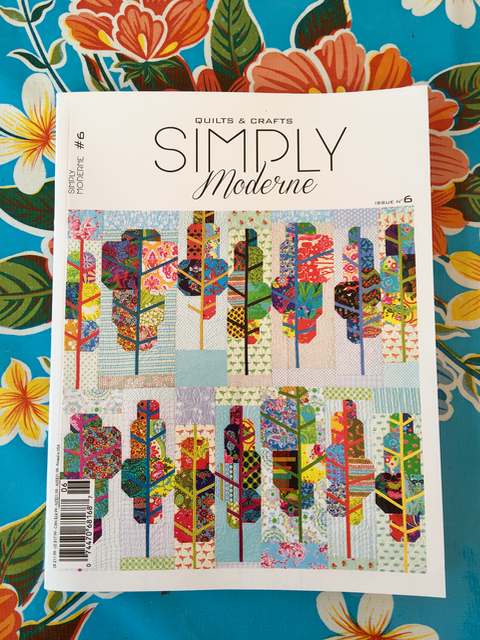 I really should subscribe to Quilt Moderne, as I can never find it in my newsagents anywhere! Is it more expensive that way, do you know? Workshops!!! I am going to predict that before long you will be jetting all around this globe showcasing and teaching your exquisite skills. This is such an exciting time for you and Mr Daisy, and i personally can't wait to be that old biddy tapping young folk on the shoulder at quilt shows into the future saying..."oh yes, of course I discovered Mrs Daisy as a talent when she was just a mere slip of a girl....we go wayyyy back......" Hahahahahahaha........because of course I had nothing to do with it whatsoever!! I actually cannot wait to see your future directions, you do have a real design talent in whatever you turn your mind to. good morning Rachael,wow so glad you renewed your subscriptions,it would been a shame to have missed your lovely pictures. I would love to sign up for all of the workshops!! 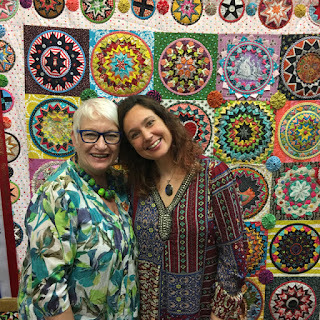 One day I will make it to your amazing country and you can bet it will include a quilt show or workshop or two. Until then, thanks for sharing your beauties on the blog for me to dream about! Remember I told you for the pics in Quiltmania ! Ah Ah !! Congrats dear Rachael and of course it's well deserved ! 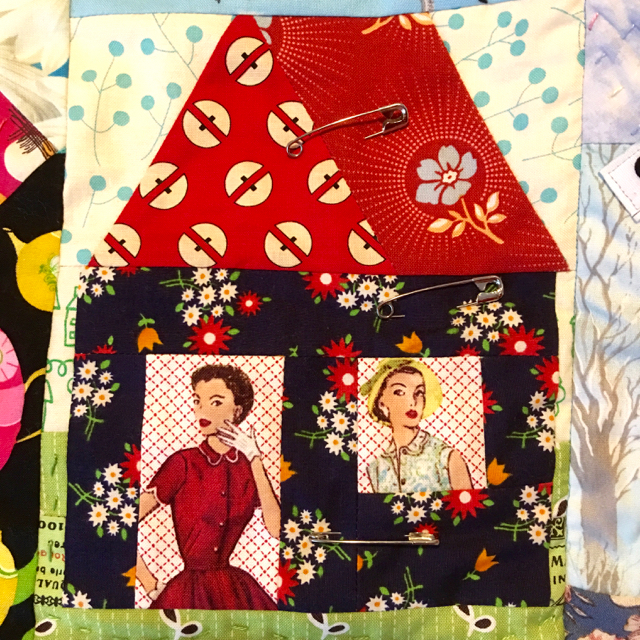 Thank you so much for sharing these wonderful quilts with us ! You certainly spent an awazing day with your friends !! I wish you a wonderful week !! congratulations on your FAME! wow to be in both prestigious publications at one time! Congratulations on all the recent awards and accolades. I loved seeing the Kookaburra. What a sweet bird. hey, looks like a liberated house to me. I have used that same fabric in a house block too. It was so fun to see your smiling face and beautiful quilts when I opened both magazines! In a way, you're right here in my living room. Sounds like you're going to teach some great classes. Lucky students! Go on with your exciting creations and thank you! You are a clever girl!! I just love how you and I have something in common, although thousands of miles apart. I just love things bright and colorful. I often mix and no match fabrics and then when its done, its so wildly colorful! I just love getting your blog post because I smile when I read your gad-abouts and published work. You are doing a wee bit of inspiration to publish something myself. Oh, YES...That is our Rachel...stunning the world with her art...Did you say the workshop is in Charlotte, North Carolina??? Cuz this old granny raising her three young grands does not have the $$ to fly to you. At least I can still see...and admire your blog..xxoo And, maybe admire your magazines...!! What exciting opportunities are ahead for you. 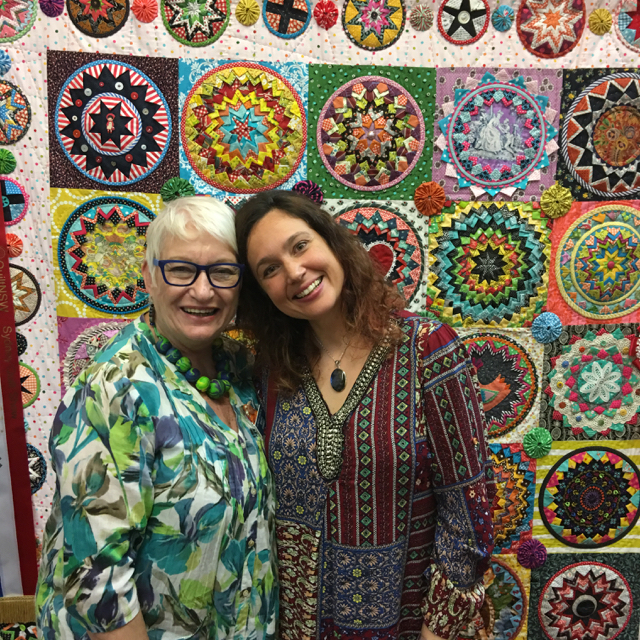 It's always a delight to see you and your happy quilts together. I love Mr. And Mrs. Happy too! Such a celebrity! And such gorgeous creative work! I love your Gypsy Carnaval! If only I were close enough to ever take a class from you! That would be a dream come true! Amazing, amazing, amazing and talented lady! You have so much happening! How do you keep up? I am so pleased the magazines have continued to showcase your beautiful quilts. The do present them well. How exciting to be able to turn these wonderful quilts into classes as well. They will be fun classes. And that peek photo shows you have not been resting, but working! Isn't that just the trouble with the internet - you see classes and workshops you'd LOVE to take, and they're just too far away!!!! I'd love to come but my fear of flying over water [and the cost] prohibits it. Can't wait to see your new quilt! That is so funny. 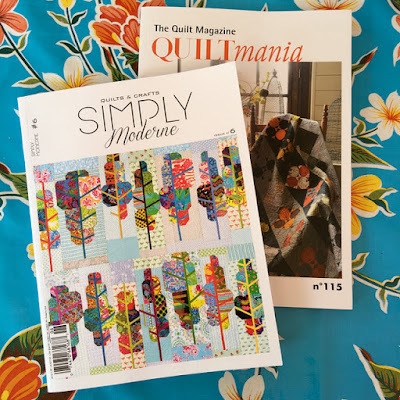 I was going to e-mail you today to tell you congratulations on being in Quiltmania (I don't get Simply Moderne, but I might have to now!). 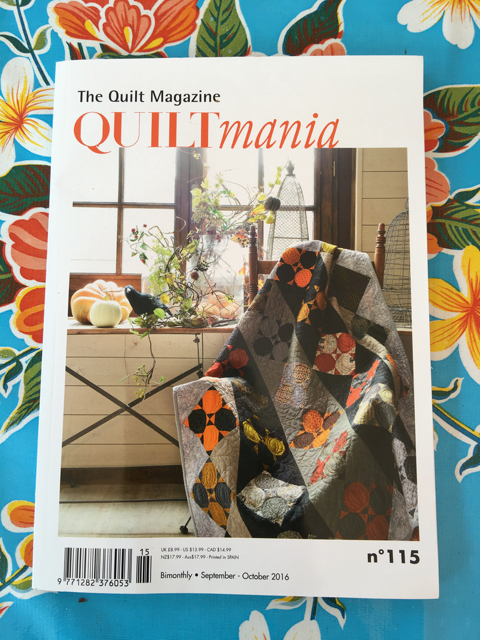 Quiltmania is without a doubt my favorite magazine. 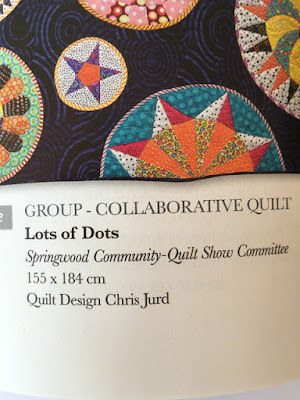 I have had two quilts in the magazine over the years but would love to meet some of the staff in person! Thanks for sharing! What a lovely post! Congratulations on your double appearances in the mags - it was so lovely to see you and your quilts in both editions. Congrats too on your classes - I'm sure they'll fill fast and if I lived up that way I'd be booking in. Just waiting for my copy of Simply Moderne to arrive, looking forward to it! Congratulations, being featured in magazines is a big thing ! I am happy for you with all the successful things that are happening in your life ! A lovely newsy post. Just as well you were able to get your copies of the magazines, seeing as you and the Springwood Quilters are star attractions. Congratulations to you all. Also, it will be exciting giving classes to the Illawarra ladies. They should have a lot of fun making their versions of your quilts. 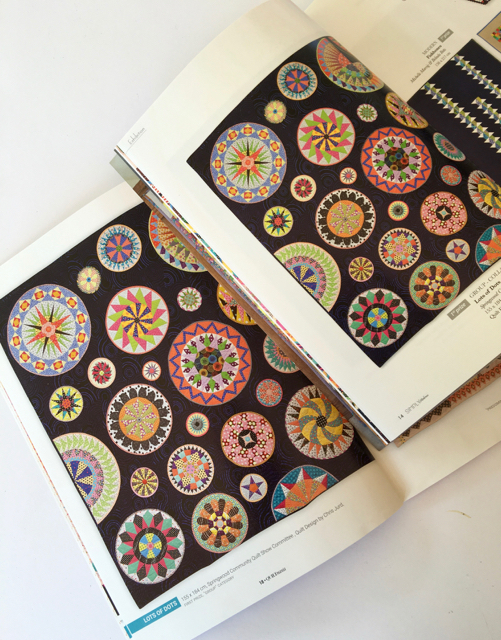 A beautiful bubbly post Rachael - just like your quilts! The workshops you will be teaching will be a treat for participants I'm sure.